One of the advantages of travelling by train is that it gives you time out to read, chat, stare out the window or think. And it occurred to me on my daily train commute that the seating layout on Irish trains could be easily changed to boost seating capacity. 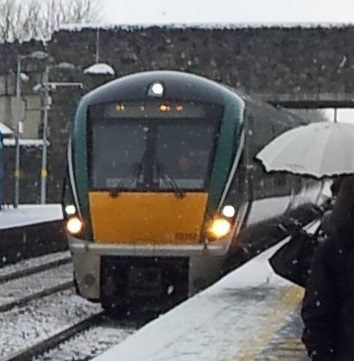 In contrast to planes and buses, where the seats all face towards the front, Irish Trains are different. Typically the seating arrangement is comprised of a set of four seats, where one pair of seats face the other with a table in between. 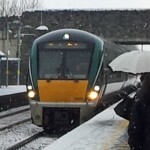 The DART trains have the central table removed, presumably as the journeys are generally shorter, but the seats still face each other. The problem with facing seats is that they are a less efficient use of space than seats in rows. See my sketch below which illustrates the point, click to enlarge. I have also drawn up the current seating arrangement for a typical centrally located DMU commuter carriage, but the seating layout change can be applied to any Irish Rail carriage. 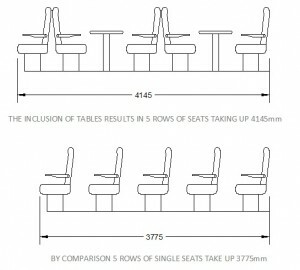 As can be seen above by removing most tables, a more efficient use of space is realised. 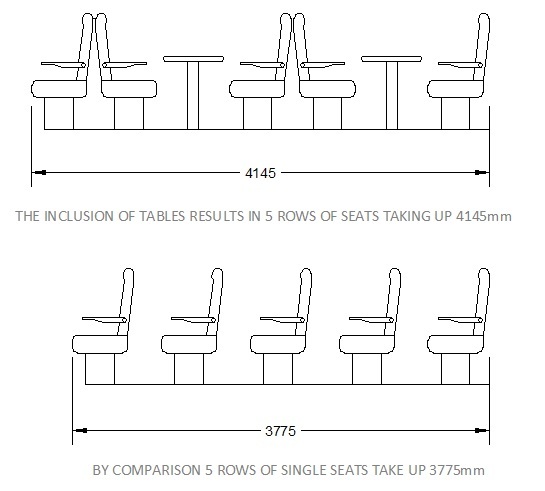 For the carriage above it allows 8 extra seats to be provided per carriage, increasing the seating capacity from 72 to 80 seats, or a 10 % increase. Isn’t this change worth considering? Where are all the traveling ladies going to put their shopping if you’ve removed their tables? I would guess the main reason train seats face each other is because half the time the train is going in the other direction. Most people prefer facing forward on a journey. This configuration also allows for more comfort, which is one of the reasons it is such a joy to travel by train. It is much cheaper to provide a more comfortable journey by rail than by air, say. Most of the trains I have been in have had adequate seating. If capacity is an issue, for example rush hour metro trains, it is far better to have side benches or all-standing configurations. If the goal is maximum efficiency, some cities use double-decker carriages which greatly increase seating capacity.